In the heaviness department, Age of Nemesis have the bases covered by echoing stalwarts such as Rush, Dream Theater, Iron Maiden and Fates Warning. 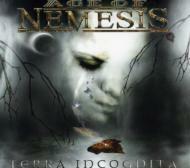 Age of Nemesis' art-rock leanings cover a diverse swarth of artists such as Genesis, Yes, Kansas and Camel. TERRA INCOGNITA is the English language version of this album from the Hungarian band.